Mad for Monaco: Happy Birthday Princess Caroline! “In a close union of spirit and heart you have always shown your affection by intimately associating yourselves with the events in my life, happy or sad. On each occasion your desire has been to share with me my sorrows and my joys. This communion of feeling, whose comfort I have always appreciated, unites us again today in a great happiness. “At 9:27 this morning, 23 January, 1957, the Princess, my beloved wife, gave birth to a Princess who has received the names Caroline-Louise-Marguerite. And joyful the people of Monaco certainly were. From that day on the people have shared the joys and the sorrows of Princess Caroline, as they did with her parents. They marveled at her stoic courage in the face of the tragic loss of her mother. They saw her take her place as the first lady of Monaco with dignity and determination. They celebrated the births of her three children, mourned at the loss of her beloved husband Stefano Casiraghi and shared in jumble of mixed emotions as her father left this life and her brother became Sovereign Prince of Monaco. Today also marks the anniversary of the marriage of Princess Caroline and HRH Prince Ernst August V of Hanover; which is most probably not a very fond memory for the family at this point though the face of little Princess Alexandra surely serves as a silver lining to the cloud that has become the Wettin-Grimaldi match. 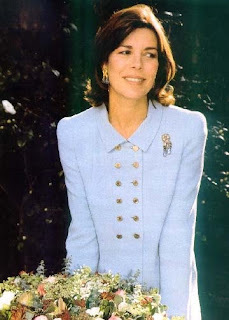 One thing can be said for sure; Princess Caroline has endured hard times before; in fact much more difficult situations than this, and surely she will come through this troubled period with the same style and civility she has always shown. Happy birthday Princess Caroline! May you have many, many more to come. Rather a bittersweet occasion, I guess. I wish her all the best. I would imagine so. It is more sad as there is a child involved but I cannot be too surprised about it. Princess Caroline should have known better. As Shakespeare said, "the heart has its reasons..."
The lovely princess et all the Magnifisos links always have lots of replys and respondents because they rule. Long live the Queen of the Internet and all the forums. Long Live the Mad for Monaco Queen of the World. I am your loyal subject-count on my allegiance.